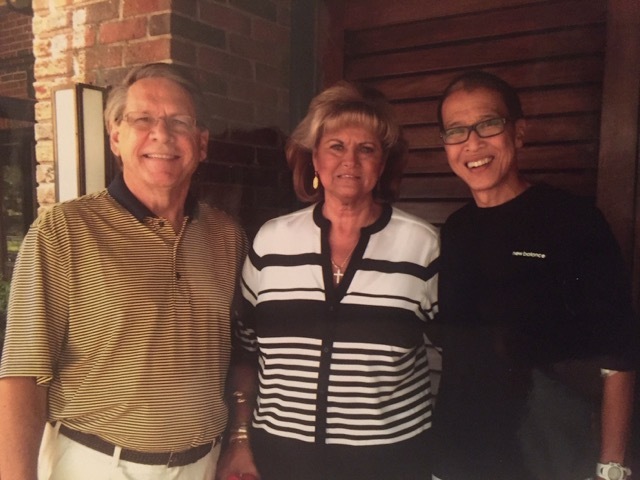 Kai Fong (right) donated to a stranger, too—Steve’s wife, Phyllis (center). No, after finding out my wife and I were not a compatible match, my kidney donation was arranged through the Alliance for Paired Kidney Donation. Having been on dialysis for several years, my wife was in need of a kidney transplant. Her quality of life motivated me to donate. She had been on the kidney transplant registry for several years and knowing it could be several more years before she received “the call,” we decided to explore other options. This is when we learned about paired kidney exchange. No, this was not a tough decision considering her current quality of life at the time. Being tethered to a life-sustaining machine four hours a day, three days a week was something we looked forward to giving up! My loving wife would have done the same for me had the circumstances been reversed. My biggest concern was the outlook on my long-term health. Completing my due-diligence exploring organ transplantation, consulting with my own physicians, and praying a lot, convinced me it was the right thing to do. They were all surprised, yet very grateful. My decision to donate sparked their curiosities regarding organ transplantation. Of course, they were all concerned for my own well-being. Even though I had completed all my pre-surgery tests at Piedmont Transplant in Atlanta, the transplant team at Baylor wanted me to repeat the same at their own facility. I felt reassured in doing so knowing I was receiving the best of care. The surgery went just as planned. I had surgery on Wednesday morning and discharge was that Friday evening. The first time getting out of bed was definitely the hardest. I was concerned about the stitches tearing when I moved. I was told getting out of bed was the best thing I could do for my recovery. I walked the entire hospital floor I was on so often that the nurses told me I was wearing out the linoleum. It really felt good moving around, even with my IV pole in hand! My home recovery went very well. I never had to take any pain meds I was prescribed for “just in case.” I did have to take it easy climbing stairs the first couple weeks, however, the pain quickly subsided. Fortunately, my surgery was during mid-winter so I wasn’t as tempted to get outdoors and overdo it. My most difficult part of recovery was constantly reminding myself, during the first six weeks post-surgery, not to pick up anything heavier than a gallon of milk. After about four weeks I would catch myself lifting more than I should because I was feeling better. You’re quickly reminded that is a no-no! Since I am retired, that was not an issue. My wife and I were notified we were matched for a donation exchange three months after becoming involved with the Alliance for Paired Kidney Donation. Normally, the organ exchange is performed simultaneously with the paired donors and recipients. In our situation, this was not the case because my recipient had a last-minute illness. My wife’s kidney transplant occurred one month after we were notified of our match. My donation occurred five months later after my recipient was cleared for surgery. The biggest surprise to me was seeing the lack of understanding regarding organ transplantation, especially paired exchange donation, by the healthcare community. I’ve run into many physicians, nurses, and technologists alike who were completely unaware that this is a growing trend! Hopefully, the word is spreading and offering hope to the many in need. I also was surprised my recipient was unwilling to meet with me after our surgery. I knew this was a possibility, but it still came as a surprise and disappointment. I respect their decision and can only hope that one day we will meet one another. Absolutely I would do it again. After my wife received her kidney from an altruistic donor, I became the second donor in our eventual chain of eleven donors and eleven successful recipients. I wish we were born with three kidneys allowing me another opportunity to give the “gift of life” to someone else in need. As a donor, I feel blessed and have a great sense of joy knowing I not only helped out a loved one but also a complete stranger and their loved ones!